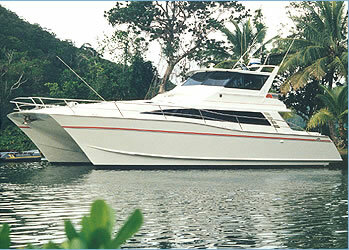 This powercat was also for a New Caledonia client and was for private extended family use. Fast lagoon cruising with an odd ocean passage has been its history. At one stage the owners considered updating, but finally opted for motoring to New Zealand, lengthening and repowering with larger caterpillar motors. All round performance increased accordingly. This craft is still used for cruising New Caledonia's lagoon, the largest in the world.